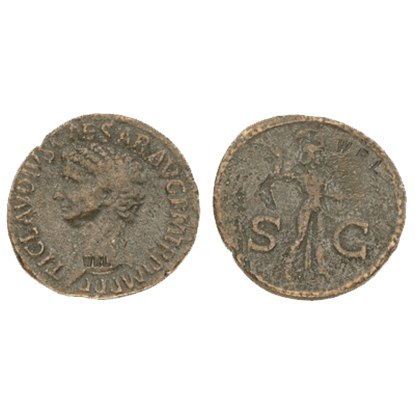 Given the span of time that the Romans held their empire, it stands to reason that they would have featured several forms of currency and coinage, especially since each emperor wanted to have his likeness on roman currency. 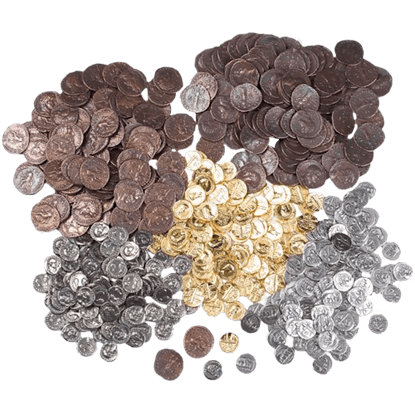 We offer a wide array of several types of roman coins, all faithful and historical reproductions, cast in pewter with either an antiquated or gold-plated finish. 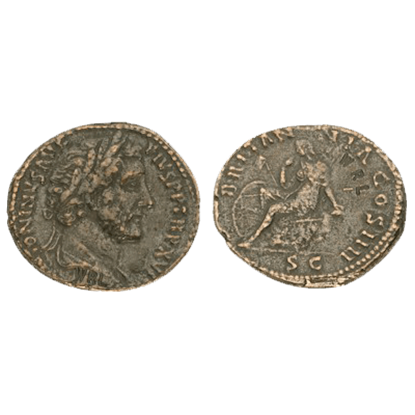 These roman coins come in various denominations, from the small as to the major denarius many of which feature the bust of the ruling emperor when the coin was first struck in history. 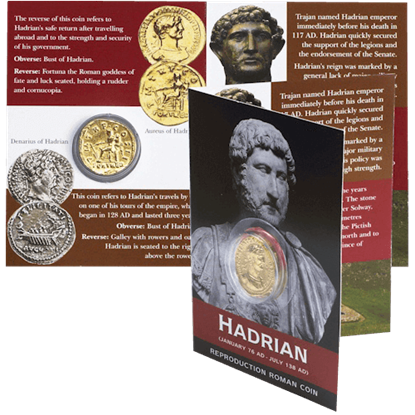 Some coins even include detailed pamphlets, offering snippets of information not only about the coin but about the Roman activities at the time of the coins creation. 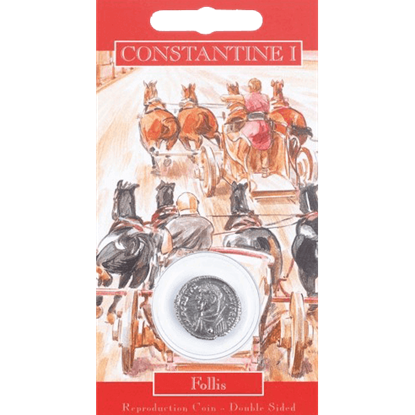 These roman coins are fantastic as gifts: they are great for collectors, gamers, and re-enactors. And if they are not given as gifts, they are great for children of the appropriate age, as well as for roman and coin enthusiasts. This 50 Mixed Roman Coins contains a mix of 10 each of 5 different reproduction coins including as, dupondius, aureus and denarius. All our coins are made from pewter that is either antiqued or gold plated. This reproduction As coin depicts the laureate head of Antoninus Pius on the obverse and Britannia seated on a rock on the reverse. These As Of Antoninus Pius Replica Coins come 10 in a pack and are great for collectors and enthusiasts. This reproduction As coin depicts the bare head of Claudius on the obverse and palladium of Minerva on the reverse. These As Of Antoninus Pius Replica Coins come 10 in a pack and are great for collectors and enthusiasts. Struck between 48-47 BC, this 22ct gold plated aureus reproduction coin is made from lead-free pewter and celebrates Caesars success in the Gallic Wars. It is a great collectible for Roman enthusiasts and collectors. This reproduction Aureus of Julius Caesar depicts the female head of Venus on the obverse and trophy of Gallic arms on the reverse. 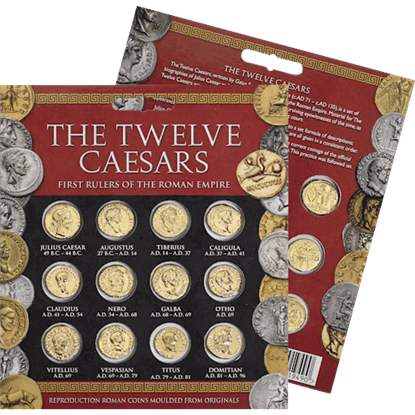 These Aureus Of Caesar Replica Coins come 10 in a pack and are great for filling your coin purse. 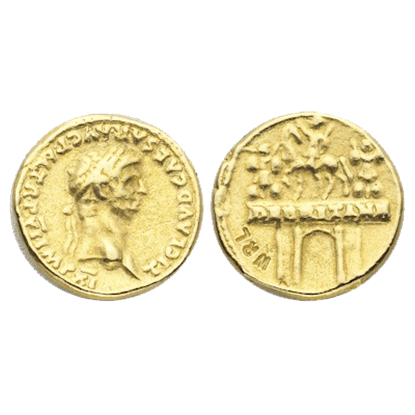 This reproduction 22ct gold plated aureus coin is made from lead-free pewter and depicts the Triumphal Arch of Claudius, built in Rome and celebrates the conquest of Britain. It is a great collectible for Roman enthusiasts. This reproduction Aureus of Julius Caesar depicts the female head of Venus on the obverse and trophy of Gallic arms on the reverse. 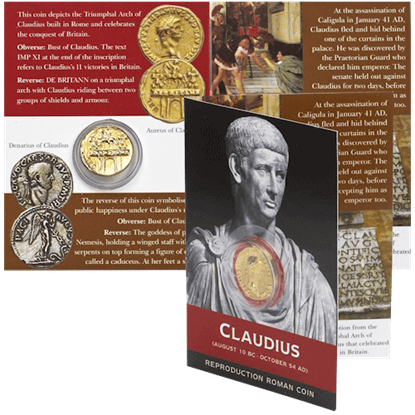 These Aureus Of Claudius Replica Coins come 10 in a pack to fill your coin purse. This reproduction Aureus coin depicts the laureate head of Domition on the obverse and upright cornucopia on the reverse. 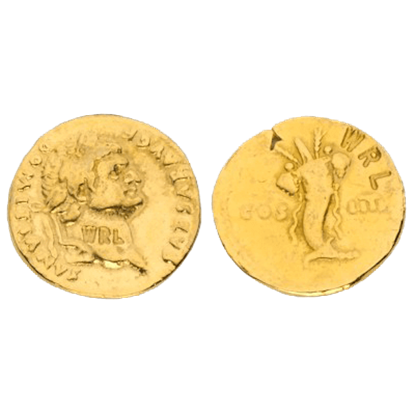 These Aureus Of Domitian Replica Coins come 10 in a pack and are great for collectors. This reproduction 22ct gold plated aureus coin is made from lead-free pewter and refers to Hadrians safe return after travelling abroad, as well as to the strength and security of the Roman government. 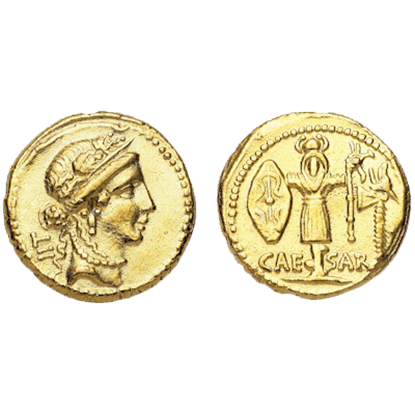 First issued by Julius Caesar, the aureus was the standard golden coin of the Roman Empire until Constantine. 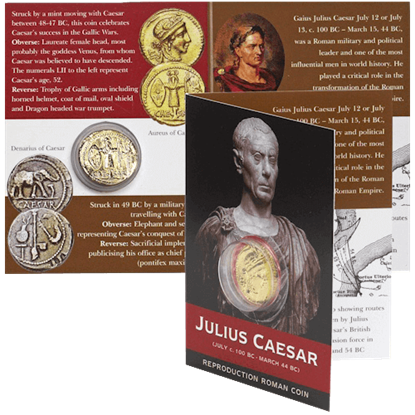 The Caesars Aureus Coin Pack includes twelve different collectible coins modeled on those of the various emperors. Our reproduction Follis of Constantine I was struck between 306-337 AD and shows the laureate bust of Constantine on the obverse and a military gate with guard on the reverse, which suggested public security at a time of unrest. This reproduction Denarius coin depicts the bare head of Augustus on the obverse and Capricorn with a cornucopia and globe on the reverse. 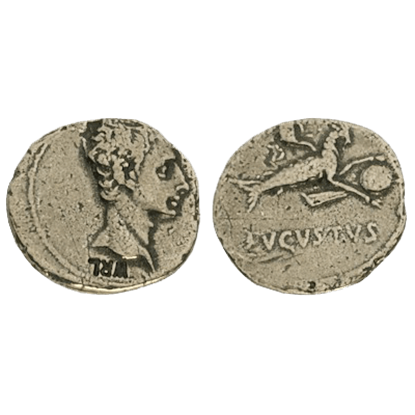 These Denarius Of Augustus Replica Coins come 10 in a pack and is great for enthusiasts.